Find the perfect balance between relaxation and invigorating activity with a stay at The Westin Lagunamar Ocean Resort Villas & Spa. Perfectly positioned for access to beautiful beaches, waterfront restaurants, shopping malls, golf courses, and some of Mexico's best underwater diving sites. Breathe in the refreshing Caribbean breeze of Mexico's Costa del Sol, where turquoise waters meet rejuvenating sun and inspiring activities. 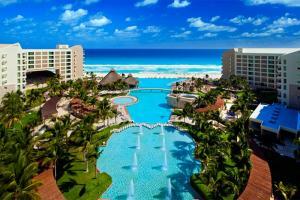 Located just 9 miles from the Cancun Airport.